Are Chicken Livers Healthy Eating? Chicken livers have fallen somewhat out of favor during the past few health-obsessed decades, but they're an excellent source of protein — while being low in fat and calories, and relatively inexpensive. The key to making chicken livers part of a healthy diet is to prepare them with little to no added fat and to enjoy them paired with fresh greens. Chicken livers are a healthy source of protein as long as you don't add too much fat or sodium when you prepare them. Proteins are made up of amino acids. Like tiny Legos, amino acids can combine in a nearly infinite number of ways, each configuration offering something specific for your body. One example from the experts at the Genetic Science Learning Center is that each antibody in your bloodstream has a different pattern of amino acids on its tip. Just as different hex wrenches work on different bolts, each arrangement of amino acids matches a specific pathogen, allowing those unwanted cells to be neutralized. You also need protein to support the collagen that holds your bones and muscles together and to build lean muscle tissue and help heal wounds. Protein is available from plant sources, but they generally don't provide a complete array of amino acids, which is why you often see rice and beans paired together. Animal proteins, such as chicken livers, contain all of the amino acids your body requires to make up complete proteins. 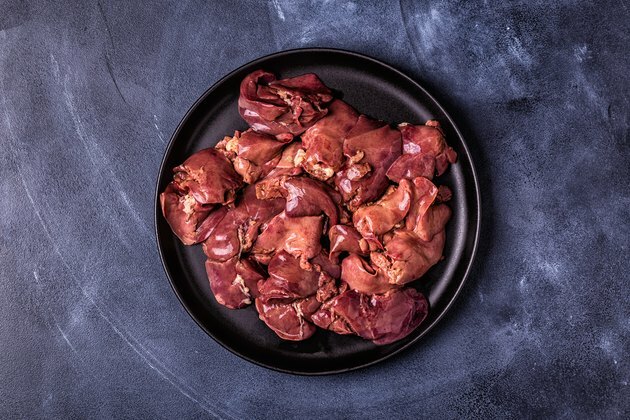 In addition, according to the health enthusiasts at Nutrition Advance, chicken livers are high in vitamin C, which is not true of most meats. They also contain most B vitamins, along with copper, iron and zinc, and are comparatively low in calories. There are three basic types of fats: trans fats, saturated fats and unsaturated fats, including polyunsaturated and monounsaturated fats. That may sound complicated, but it's actually pretty simple. As broken down by the experts at the American Heart Association, trans fats are created when hydrogen is added to liquid vegetable oils, giving them a longer shelf life when used to created nondairy spreads, commercial baked goods, cookies, crackers and some breads. These are the least healthy fats and should be avoided. Saturated fats are solid at room temperature and are generally found in animal products. They've gotten a bad reputation over the years, but are not actually as bad for you as previously believed. Beef liver benefits, for example, may outweigh the negatives as far as nutrition, especially for people suffering from anemia. It's the same with chicken livers and other foods with a high iron content and complete collections of amino acids. Polyunsaturated and monounsaturated fats are found in fish, avocados, nuts, olives, and oils such as canola and olive. They help raise your level of good cholesterol and lower your levels of bad cholesterol. Liver is one of the most nutritious foods you can eat, according to the University of California's Berkeley Wellness program. Chicken livers have vitamins, minerals and protein, while containing only 180 calories and 6 grams of fat in a 3.5 ounce serving. Preparing chicken livers as part of a tasty, nutritious meal isn't hard. You can rinse and season them, and simply pan saute them in a skillet with a bit of olive oil, garlic, pepper and salt. Finish with a splash of red wine or lemon juice. Slice them thinly and serve on a bed of mixed greens, diced apples, diced red onions and a light vinaigrette. Dip the chicken livers in an egg wash; roll them in flour or corn meal, and fry them until they reach an internal temperature of 170 degrees Fahrenheit. Serve them with an assortment of dipping sauces or with gravy. To make pate, cook chicken livers in olive oil and white wine or dry sherry until they're done. Place them in a food processor and blend with cream cheese or plain Greek yogurt. Season with garlic salt, lemon pepper, thyme and sage. Fold in chopped walnuts; garnish with chopped parsley and rosemary. Chill the pate until it has cooled throughout and serve with woven wheat crackers or crusty bread. Genetic Science Learning Center: What Are Proteins? University of California, Berkeley Wellness: Liver: Love It or Leave It?